7-6?! 7-8?! 7-9?!!!! Yes! Tennis! THIS is what we want! No joke this Dimitrov kid, eh? And I love Xan Brooks constant use of corrida metaphors: “Steely experience won out over youthful flash and fire. The matador speared the bull.” Surprised The Guardian’s P.C. Thought Police or some pissy PETA chicks haven’t gotten on his case. He uses them constantly. It was tough and it was tight, but it went according to plan. Steely experience won out over youthful flash and fire. The matador speared the bull. Full credit to top seed Novak Djokovic, who kept his cool throughout a terrific, red-blooded contest that could very easily have gone to the fifth and final set. But credit, too, to Grigor Dimitrov, who put up a vibrant fight out on a dusty, dissolving Centre Court. Hi chance, no doubt, will come again. 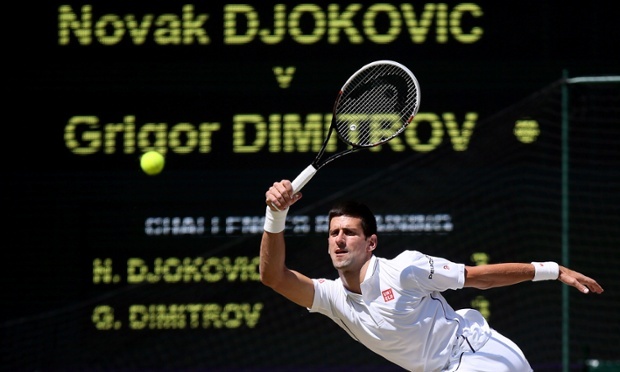 So that’s it, Novak Djokovic advances to the Wimbledon final, where he faces the winner of the second match between Roger Federer and Milos Raonic. That’s just getting started. You can follow it here. And we all know, few apologies from me either. From here till the Flushing it’s mostly tennis from me or me fretting about tennis. I’m gonna be in Belgrade Tuesday. If Nole takes the title it’s gonna be a mad house. Actually, either way. P.S. I had said: “But pretty sure it’ll be Nole and Federer in the end, though Federer over Raonić is not that easy a call to make.” Turned out it was an easy call to make; what a little mariconada of a game compared to the death match between these two. Now I don’t know what that means for Sunday’s Final: that Nole will be exhausted after tearing it up like a mountain lion for the past month while Federer’s energy-conservative style will have him all relaxed and fit — or Nole will still be in high gear and Federer playing old-man, one step closer to retirement style. ← PS: Guys, where has Janko Tipsarević disappeared to?